Truddabellz Creations: Have a Pinky BDay! Wow! How time is flying by. I don't know how I got so far behind in my postings. Yikes! I will spare any details of whys.....Thank goodness right? Hee Hee Hee. I have not been a total slacker.... I have had time for crafting and have made up some cards, it's the postings that I have neglected to do. Lets see if I can make up for all lost time and post some cards that I have done for some special occasions in past six months. 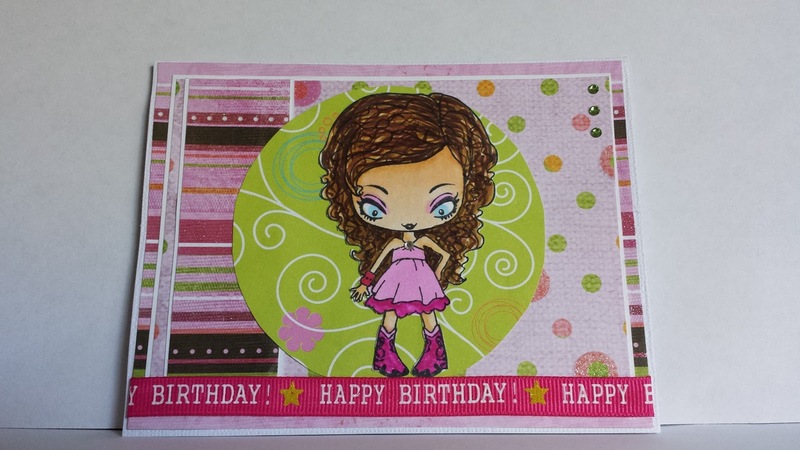 Of course, Birthday cards are always a must have in one's stash. This particular one I can only take partial credit for coloring..... Funny story about it... I started coloring to practice up on curly hair. So while experiment coloring the curly hair on this TGF stamp, my Granddaughter looked over at me and asked if she could finish this one up. It's not the first time she has taken some of my artwork. How could I say no now? I'm just happy to see that someone loves my artwork. Lol. 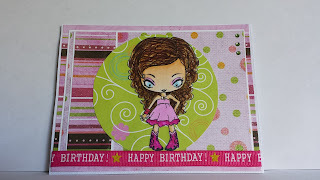 She finished coloring in TGF Sasha from the Creeper Crew Collection 1 stamp set, while I put together the card Sasha would go on. When KK, my Granddaughter, finished she did the funniest thing I think I have seen..... she plucked a little gem off her shirt to glue onto Sasha's dress. Too funny, right?